The woman wore a skull mask. 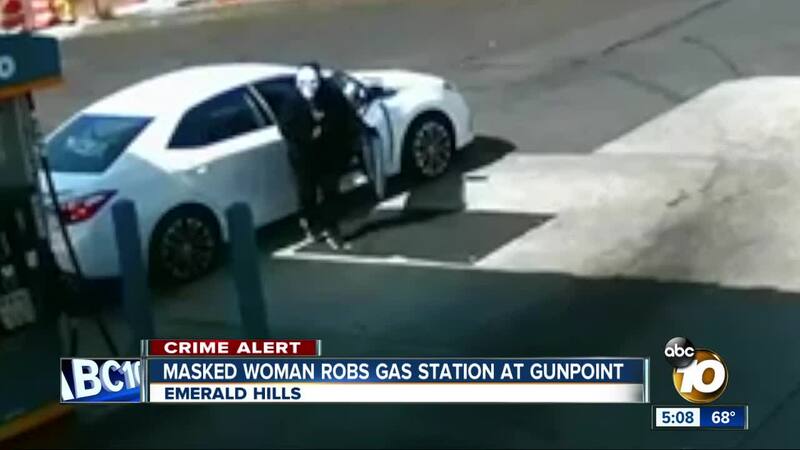 SAN DIEGO (KGTV) - Police released images and surveillance video in hopes the public can help identify a woman suspected of robbing an Emerald Hills-area gas station in early October. According to San Diego police, the armed robbery happened at the Valero gas station at 1025 Euclid Avenue on Oct. 2. Police said a woman ran into the gas station’s store at 1:30 p.m. that day and went behind the counter. She pointed a handgun at the clerk and demanded money from the cash register. After getting an undisclosed amount of cash, the woman left the store and was seen getting into the front passenger’s seat of a newer, white Toyota Corolla. The vehicle, which did not have license plates, was seen driving away northbound on Euclid Avenue. The woman is about 5 feet 5 inches tall, weighs 140-160 pounds and was wearing a white skull mask, black hooded sweatshirt, black sweatpants, and black and silver-colored tennis shoes. Her race is unknown. Anyone with information on the suspected robber or the incident is urged to contact the SDPD Robbery Unit at 619-531-2299 or Crime Stoppers at 888-580-8477. Crime Stoppers is offering a reward of up to $1,000 to anyone with information that leads to an arrest in the case. Tips can also be submitted anonymously at www.sdcrimestoppers.org .